Evil Queen is a fuchsia and magenta microglitter with blue and silver flakes in a clear base. I thought this would be a bit sheer, but I found that 2 coats was sufficient. It's incredibly sparkly...even more than what my pictures show. 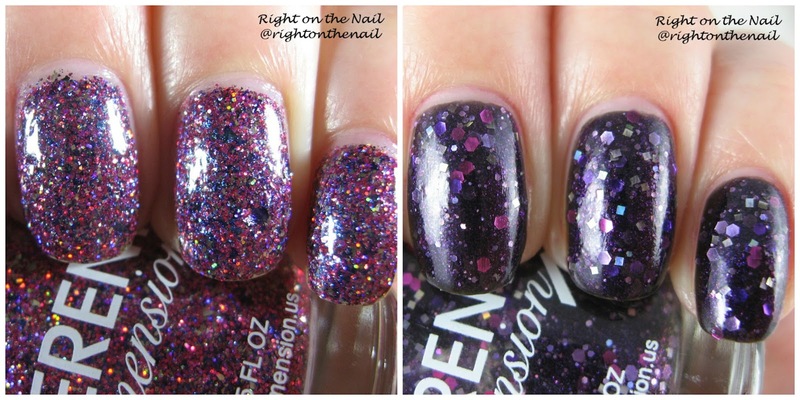 The formula was fine, but the microglitter makes it dry with a bumpy finish so you may need to double up on topcoat. Wars Would Never Start was a special polish released for Black Friday that retailed for only $5. I'm not sure if this will be available again (maybe next year), but it still gives you an idea of how their glitter crellies look and apply. It's a blackened crelly base with purple shimmer and silver, magenta, and purple glitters. Have I told you lately how much I love square glitter? Two smooth coats is enough to cover the nail line and show depth of the glitter in the base. This was definitely worth the $5! What did you think of Different Dimension? As I said before, these polishes are not currently available, and I feel so bad I wasn't able to show these to you in time. If you don't want to miss out on anything Different Dimension, follow them on their website, Facebook, or Instagram pages.